The Songza iPhone app offers a curated selection of playlists by music experts and respected publications. Do you need a playlist for “epic walking,” or are you feeling “angsty?” Perhaps, you’ve heard all of the muzak you can stand, and you want to bring a new perspective with “office crowd pleasers.” The Songza iOS app is your cool, new personal DJ. The Songza iOS app has fantastic content, but the navigation is muddy. The home screen seems straightforward with a menu bar at the bottom of the screen to access concierge, my playlists, popular, explore, and settings with one touch. The screen is filled with the concierge content where you choose from the suggested playlists. Once you select a playlist, the screen fills with the album cover. There is a menu bar at the bottom of the screen with pause, play, like, and dislike icons. An unobtrusive ad bar rests just above the bottom menu bar. There is a menu bar at the top of the screen with the artist, song, and two icons. The icon on the left side opens a sliding menu similar to Facebook’s iOS. There is great information about the playlist, as well as the ability to share the playlist to Facebook and Twitter, email, like the playlist and purchase the music. The icon at the top right of the playlist screen takes you back to the home screen. The Songza iPhone app’s navigation is not intuitive and confusing, as the playlist screen is filled with the album cover that provides virtually no content and functionality. You can’t touch the album cover to initiate action. An improvement to the functionality would be to always have the ability to explore the Songza iPhone app with a consistent navigational tool. If it’s a bottom menu bar, then that bar should move through the iOS app. The same consistency could be accomplished with a sliding menu bar as well. Music nerds and snobs will certainly overlook the clunky navigation, as the playlists are extremely interesting and impressive. David Byrne has a playlist. Songs sampled by Kanye West are featured. Pitchfork’s selections are available. 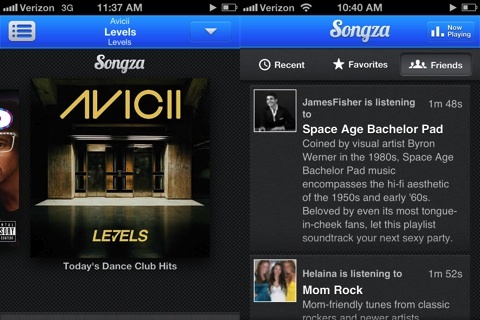 Music of every genre, taste, and sensibility is contained in the Songza iPhone app. You don’t have to work hard to create a playlist, and it doesn’t cost a fortune in downloads and time. Songza’s iPhone app has the perfect soundtrack, and hopefully will have perfect navigation in a future update. AppSafari review of Songza was written by Jenni Ward on July 5th, 2012 and categorized under App Store, Free, iPad apps, Music, Universal. Page viewed 5880 times, 1 so far today. Need help on using these apps? Please read the Help Page.